This 20-hour training (18 hours in person, 2 hours self-study) will emphasize the core components of the practice and process of trauma sensitive yoga, and how they relate to any anti-oppressive and trauma sensitive work. The training will provide specific tools to support participants to facilitate trauma-sensitive movement and breath practices that are vital to the healing process of complex trauma. This training is designed for social workers, activists, mental health clinicians, yoga teachers, educators, and other health care professionals who are looking to deepen their understanding of the whole-system impact of complex, intersectional trauma. There are no pre-requisites to take this workshop, all are welcome. Additionally, it is designed to support those professionals in expanding their current practice to incorporate aspects the Evidence Based Practice (EBP) of Trauma Center Trauma Sensitive Yoga (TCTSY) through expanding their knowledge of the impacts of complex trauma on the nervous system and broadening their repertoire with trauma sensitive movement and breath. 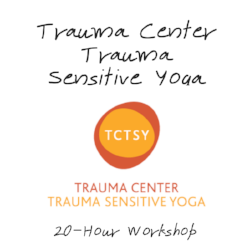 This weekend training qualifies as the pre-requisite for application for Trauma Center Trauma Sensitive Yoga's annual certification program and is eligible for Yoga Alliance CEs (18 contact, 2 non-contact). Please let us know if you need Yoga Alliance CEs. Friday, April 5 from 6:00 - 9:00 p.m.
Saturday, April 6 from 10:00 a.m. - 6:30 p.m.
Sunday, April 7 from 10:00 a.m. - 6:30 p.m. Please note, there is a one-hour lunch break on both Saturday and Sunday. Anna is a psychotherapist, neurotherapist and Trauma Center Trauma Sensitive Yoga facilitator in the greater Boston area. She holds weekly TCTSY classes and is also a trainer and supervisor for the TCTSY training program. Anna has experience working with a culturally and clinically diverse population of children, adolescents, adults and families in domestic and international settings and has worked for research institutions such as Harvard Medical School, Boston Medical Center, The Trauma Center, National Institutes of Health, and the Veterans Administrations Hospital. She holds a Bachelors degree in Neuroscience from Brandeis University and Masters degree in Mental Health Counseling and Behavioral Medicine from Boston University School of Medicine. Anna utilizes yoga, biofeedback and neurofeedback in her clinical work and specializes in incorporating compassion and mindfulness into empirically validated treatments.